In our last post, we talked about the importance of rightsizing your propane tank – one of the key considerations when it’s time for a propane tank upgrade. Today we’ll talk about important factor in your decision: buying vs. leasing. Should I buy or lease my propane tank? 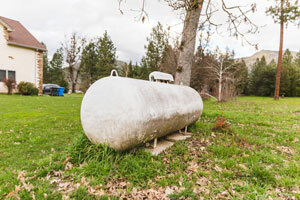 At its most basic, the decision to buy or lease a propane tank comes down to two considerations: cost and responsibility. Let’s take a look at both more closely. Cost – If you buy a propane tank, of course, you own it for life, and you are free to choose any propane provider who serves your community. But that freedom comes at a high cost – in excess of $2,000 up front, not including the regulator(s), blocks, or an anode bag (if needed). You’ll also have to pay to have the tank properly secured and installed, which adds to that total – and If you choose to bury your tank, you’ll also incur costs for excavation and concrete. When you lease a tank, you incur none of those costs; this is one of the key advantages of leasing. If you lease, you’ll also avoid all future costs associated with maintenance and repairs – a potentially huge benefit in the long run (see point 2 below). Responsibility – A propane tank is a fairly simple piece of equipment – but because it holds pressurized propane gas, it is critical to maintain it properly, and to fix any problems that occur with it immediately and safely. The question is, who’s going to be responsible for all of that work? When you purchase a tank, you are responsible for the upkeep of the tank, regulator(s), valves and lines. That means you incur the cost of ongoing maintenance, including replacement parts – not to mention having to keep your tank compliant with local, regional, and federal codes. If you lease a propane tank from Hocon, we take care of both installation and routine maintenance. All you have to do is pay your propane bill and enjoy the comforts of your Connecticut home. If it’s time for a new propane tank, leasing from Hocon is the smart choice. Our expert technicians can get your tank up and running quickly and safely, with minimal disruption to you and your family and in compliance with all EPA and state codes and laws. We’ll even perform a free pressure leak check on your home system for even more peace of mind. Ready for a new propane tank? Call in the pros at Hocon! Contact us today for a FREE, no obligation estimate and lease terms on a propane tank installation anywhere in our service area.